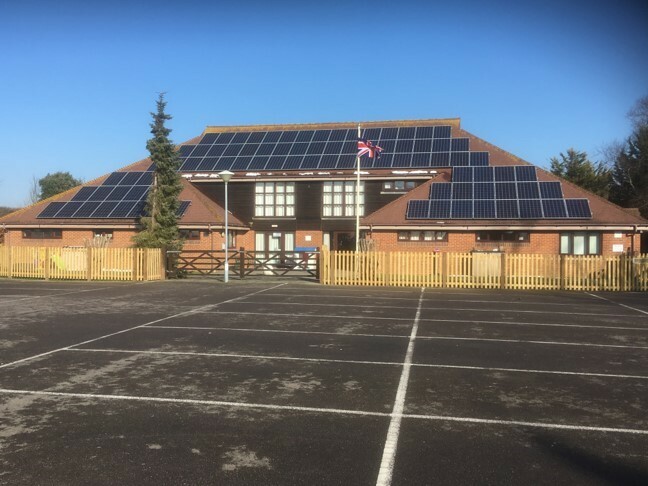 87 solar panels have recently been installed at Pagham Village Hall. “We are fortunate to have a Trustee, John Carr, who was a civil engineer and able to research and manage the project. The solar panels were installed by Arundel-based Trienergy Solutions Ltd at short notice in the run-up to Christmas in order to beat an end-of-year reduction in the feed-in tariff for new installations. They achieved this with no disruption to the operation of the busy village hall. “It is early days to know whether the predicted payback will be achieved, but we can see that on days of strong sunshine, we are meeting nearly all our day-time electricity requirements from the solar panels and generating a healthy surplus to export to the grid. “The project has been supported by a grant of £9,879 from the Inspire Leisure Grant Fund, operated by Action in Rural Sussex, which has met just under one third of the costs”.